Would you be interested in locking in your scrap price for anywhere from one to twelve months in the future? If so, B.L. Duke can now offer you a fixed price with customizable terms. No more waiting month to month to find out what you are going to get for your material. We can offer these fixed prices through the utilization of scrap futures to hedge the risk. A hedge is an investment that reduces the risk of adverse price movements to a specific asset. In this case, that asset is your scrap metal. Whether you have a project on the horizon where you will be producing an abnormal amount of scrap or you produce a steady amount of scrap per month, we can help reduce scrap market risk by selling futures contracts for the months you expect to sell us the material. How does it work? We enter into a written agreement whereas you agree to sell B.L. Duke a committed number of tons per month for an agreed upon period and B.L. Duke agrees to pay a fixed dollar amount for that period, regardless of market conditions. Think of this as an insurance policy on your scrap metal revenue for the agreed upon period. This will allow you to forecast your scrap revenue over a given period without the worry of markets going down. The fixed price would be established on the day that you committed to it as we will be utilizing futures markets to allow us to provide this fixed price to you. In order to make it worthwhile for both parties, we suggest that the tonnage covered by this agreement be a minimum of 1,000 tons over the period of the contract. “Hedging scrap market risk by utilizing scrap futures is an innovative way that can help mitigate exposure to the scrap market in 2019,” says Lou Plucinski, President of B.L. Duke. At the November 2018 Fastmarkets AMM Conference in Rosemont, ferrous scrap futures were a key topic along with freight rates, the zorba market and the automotive outlook for 2019. According to an article posted on the AMM website, Five things we learned in Chicago, the Section 232 tariffs have heightened volatility and uncertainty in 2018, which have increased the need for better price risk management tools. Contact your B.L. Duke buyer today to set up a time to discuss your recycling program and how we can lock in a scrap price free from fluctuations. Follow B.L. Duke on Twitter, Facebook and Instagram for news and market updates in the steel and scrap metals industry. Summer 2018 has been extremely busy with the opening of our NEW stevedoring and storage subsidiary, B.L. Duke River Transport (BLDRT). Located on the Des Plaines river adjacent to our Joliet processing facility, BLDRT took over the Gerdau Rolling Mill, adding 250,000 sqft of indoor storage and 30.5 acres with barge and rail access. The US river system is surprisingly vast. Barge freight can extend from the East and Gulf coats as far west as Omaha and north to Minnesota and the great lakes. While the term stevedoring may sound unfamiliar, it has been around for hundreds of years; longshoreman, dockhand and dockworker are all phrases used to describe the loading and unloading of water vehicles. 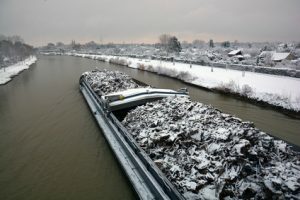 BLDRT will backhaul scrap barges with finished steel product from the mills direct to consumers in the Chicagoland area. B.L. Duke River Transport offers customers an alternative cost savings transportation method during this difficult logistics climate. In a recent article published by the Daily Herald, the trucking industry has fallen on unprecedented times due to “added regulations, fewer driver hours and even fewer new drivers entering an already depleted industry.” This has caused an almost 40% surge in rates from last year. Utilizing the river system is significantly cheaper, up to four times less expensive, than standard trucking routes (see image). The availability of a facility on the river and the market’s demand of a pricing solution to the rising costs of the trucking industry have positioned BLDRT as an efficient transportation partner. “BLDRT has the unique opportunity to bridge our mill relationships to service centers and manufactures,” states Kathleen Grady, VP of Business Development. “Our customers will no longer need to buy barge load quantities to take advantage of the significant cost saving that river freight offers.” B.L. Duke River Transport has heavy lifting capacity up to 500,000 lbs. and can ship directly to your facility via rail or truck from our convenient location off of I-80, I-355 and I-55. For JIT inventory programs, outdoor and indoor storage is available with climate controlled space coming this winter. At B.L. Duke, we are always looking for ways to better service our customers whether it’s through technology, communicating industry knowledge or passing along cost saving practices, we continuously strive to revolutionize the scrap metal industry. B.L. Duke River Transport is Innovation on the Move – call or email us today to find out more: 815-714-8900 or info@blduketransport.com. We’re more than excited to announce B.L. Duke was recognized as one of Crain’s Fast Fifty Companies for 2018! Each year, Crain’s releases its Fast Fifty list, which recognizes Chicago-area companies that have shown significant growth over a five-year period. This is the second time we’ve made this list; with the first time being in 2015 for growing nearly 300 percent in five years. Between 2013 and 2017 we’ve grown over 400%! In 2017, we increased sales revenue by 65% and added 32 employees to our workforce. We’ve had so many exciting happenings in the last year, it’s hard to keep up. This year we were also named a finalist for the 2018 American Metal Market’s Steel Excellence Awards in the Scrap Metal Company of the Year category. In addition, we recently completed plans to double our footprint with the acquisition of the Gerdau Rolling Mill next to our Joliet campus, which will allow us to plan for additional products and services that will pass on even more cost-savings and conveniences to our customers. Check out our NEW division B.L. Duke River Transport, which offers stevedoring and indoor/outdoor storage services for your finished steel product. With our prime location on the Des Plaines River in the Chicagoland area, BLDRT provides cost-saving transportation efficiencies through transloading to rail or truck direct to your facility. On July 30th, we also announced the Grand Opening of our over the scale business in Joliet and are now open to the public. For more information or a list of services you can check out our website at www.BLDUKE.com or call 773-778-3000 and ask to speak to a sales team member. We couldn’t be more excited to announce the launch of our new wholly owned subsidiary, B.L. Duke River Transport. Our new division will focus on stevedoring services with both indoor and outdoor storage. It gives us the ability to transload finished steel product, including coils, bar stock, rebar, wire, and structural steel, to rail or truck from barges coming from mills along the river systems and imports. According to this week’s AMM article, B.L. Duke adds steel terminal services, with trucking rates and availability becoming increasingly inhibitive, B.L. Duke will continue to grow it’s barge and rail services not only as a means to control our own logistics costs but now as a diversification strategy and new revenue source. B.L. Duke River Transport will be housed on our recently acquired site of the former Gerdau Rolling Mill property at 1 Industry Avenue, Joliet, Illinois. The property is conveniently located adjacent to our Scrap Metal processing facility in Joliet, equipped with barge and rail terminals. With 30.5 acres and a 250,000 square foot warehouse, this will nearly double our footprint to almost 64 acres. The new location is significantly closer to Chicagoland’s industrial areas compared to Indiana ports. In addition, the new site is in close proximity to several major highways and rail terminals, including I-55, I-80, and I-355. “With trucking rates and availability becoming increasingly inhibitive, we will continue to grow our barge and rail services not only as a means to control our own logistics costs but now as a diversification strategy and new revenue source,” said Plucinski. The new division comes after our continued growth and success in 2017. Last year, we increased our sales revenue by 65% and added 32 employees to our team. We were even named a finalist for the 2018 American Metal Market’s Steel Excellence Award in the Scrap Company of the Year category! “You can bet that we have even more plans in store for 2018. We’re excited to expand our scrap-metal processing capabilities and strengthen our relationships with both mills and our customer base,” said Plucinski. Contact us today at info@blduketransport.com to find out how B.L. Duke River Transport can help transload and store your finished goods! We here at B.L. Duke are pleased to announce that we have been named a finalist for the 2018 American Metal Market’s Steel Excellence Awards in the Scrap Metal Company of the Year category. Winners will be announced on June 26, 2018 at The Edison Ballroom in New York City, New York. Every year, American Metal Market recognizes the highest achieving companies in the steel industry for innovation and initiative across multiple categories. This year’s finalists total 53 companies across 15 categories. Finalists were selected by senior American Metal Market editors, and those entries will be scored by steel industry veterans who serve as judges to select the winners. B.L. Duke is the only finalist from the Chicago-land area. Other finalists in the Scrap Metal Company of the Year category include Ferrous Processing & Trading Company, Liberty Iron & Metal Inc, PSC Metals, Schnitzer Steel Industries Inc, Sims Brothers Recycling, Triple M Metal LP, and W Silver Recycling Inc. This recognition comes after a year of continued innovation and growth for us. In 2017, we increased sales revenue by 65% and added 32 employees to our workforce. In addition, we recently completed plans to double our footprint with the acquisition of the Gerdau Rolling Mill next to our Joliet campus, which will allow us to plan for additional products and services that will pass on even more cost-savings and conveniences to our customers. At this time last year, we had a lot to be optimistic about. In 2017, the market rebounded moderately with continued growth after a tough 2016 market. Now, we are a couple months into the new year and are predicting a bright 2018 outlook for the scrap metal industry. Markets kicked off with a generous increase of $30/gt for cuts and $20/gt for primes. We saw a little sneak preview of a similar boost back in December. As history shows, January typically tends to be a strong month, while February falls flat. However, buyers, sellers, and brokers are particularly bullish. Towards the end of 2017, Nucor’s DRI (direct-reduced iron) plant in St. James, Louisiana was forced to halt production due to an unforeseen outage. This forced Nucor to consume more scrap than expected, driving ferrous scrap prices upward. Recent inclement weather is another reason to give confidence in a forecasted increase. The Midwest and East Coast were stricken with tough winter conditions within the last month. Considerable amounts of snow and frigid temperatures made for logistical disasters and a slowdown of operations. Supplies are low, driving for high demand. According to ISRI (Institute of Scrap Recycling), other factors adding to an uplifting market are potential trade remedies from Section 232 steel investigation and other trade cases, steel production cutbacks in China, recovering iron ore prices, healthy domestic order books, and the new corporate tax cuts. Heading into the new year, the biggest concern in the scrap industry seems to be China’s ban on scrap imports. Mid 2017, China caused an uproar by announcing their plans to the World Trade Organization (WTO) to tighten their threshold of impurities on scrap imports, unlike the rest of the world that follows the global standard. “ISRI is very disappointed to see the Chinese government finalizing its Environmental Protection Control Standards and failing to take the opportunity to bring them in line with global standards that reflect manufacturing requirements and are utilized by environmentally responsible recycling operations in the US and around the world,” ISRI president Robin Wiener said in a statement. There are still many questions and doubt heading into the new year regarding the ban. Learn more about China’s ban on our last blog post. The Midwest Chicago market saw another change recently when the January AMM was released with “Historical” and “Expanded” pricing. The change was put in place to start including 3 Indiana mills and an Iowa mill to justify logistical differences. Both numbers will be released for the next 6 months, then will be down to one “expanded” category come June 30, 2018. The new category will be listed the way it always has been, as “Chicago“. Though expanded prices are showing higher right now, we believe sooner rather than later the prices will end up aligning, before the 6 month period is over. What are your thoughts on the 2018 steel market? Comment below! Recently there has been uproar in the recycling industry and to be candid, we didn’t think this news would have such an effect on the Scrap Metal Industry. In July, China proposed a new ban at the World Trade Organization (WTO). Although the ban hasn’t gone into affect, the world is experiencing some significant disruptions. How will this impact the global economy and most importantly, what will it do to the Metals Industry? What is the “Big Ban”? According to The Institute of Scrap Metal Recycling Industries (ISRI), there are two important parts to this ban. First and foremost, the proposed ban limits or prohibits 24 different imported materials into China. Most are solid waste, such as paper, plastics, slag, waste wool, ash, cotton, and yarn. The second part of the ban includes a “carried waste” threshold, and this is the part the Metals Industry needs to pay close attention to. China’s proposed draft of the ban includes a 0.03% “carried waste” threshold on all imports into the country. Carried threshold meaning the contaminants and prohibitive materials that are commonly mixed in with recyclables, including scrap metal. Currently, the global standard is 0.05-5.0%. The ban also mentions a proposed 80% weight requirement on all metal and electrical appliance scrap and the current global standard is a 50% threshold. According to China, the ban and the proposed carried waste threshold are in efforts to replace foreign materials with domestically generated material. China claims they want to reform their import system to protect the health of their citizens and environmental interests. To date, Chinese authorities have yet to divulge any specific details. Many exporters are uncertain whether the ban includes their materials, such as certain plastics, slag, mixed paper. After the announcement, the WTO requested China release more specific details. In response, China’s Ministry of Environmental Protection has released a draft of changes of some technical specifications. For imported scrap, stricter regulations on impurities, weight requirements for metal and electrical appliance scraps. However, many unanswered questions remain. For non-metallics, China’s ban on paper and plastic would affect 18% or $532 million of USA scrap. The scrap trade to China is worth $6.5 billion annually and impacts 150,000 US jobs. Currently, 40% of the USA’s total exported scrap goes to China. The plan would essentially affect all mixed metals, especially scrap products that must be dismantled, such as cable, scrap wires and scrap motors. With that said, the paper, plastics and copper industries have already been experiencing disruptions in their day to day operations for some time now. Although the ban hasn’t gone into effect, Chinese importers report having trouble securing permits. China accounts for more than half of the world’s total scrap imports and this ban won’t only affect the United States economy but the world economy. After China’s vague announcement at the WTO, ISRI immediately spoke up and voiced their concerns. ISRI has urged China to specify the difference between the term “waste” and “scrap”. Many recycling experts, including ISRI, are very concerned how China can possibly measure 0.03% and place such tight controls on imports. According to the Bureau of International Recycling, restrictions on scrap imports into China will become more and more aggressive as time goes on. Many leaders understand what China is trying to do environmentally, but there needs to be consistent threshold for fair global trade and ISRI plans to fight the ban. The biggest take away is China’s need to have clearer details and specifications of the ban. In the immediate future, the Metals Industry needs to be alert and keep a close watch on the proposed “quality threshold” specifications. This month we are proud to be celebrating our 17th anniversary! Today, more than ever, we are laser focused on our mission. “We are revolutionizing the recycling industry through technology and transportation efficiencies to drive responsiveness and maximize client value.” The following video features our Joliet yard and showcases our growth and capabilities. Since 2000, we’ve taken an integrated personalized recycling approach. Today, we are able to offer our customers greater value than ever before. We owe this success to our two convenient scrap processing locations and our new state of the art technology system, allowing us to be transparent through real-time load tracking. Within the last year of the Joliet expansion, it’s abundantly clear why this move has set us apart in the industry. Our processing and freight capabilities, visibly highlighted in our new video, are the reasons behind this success. This facility coupled with the tenacity of our team will drive our growth into the next phase of B.L. Duke. Reach out to us if you are interested in touring our Joliet yard in person!